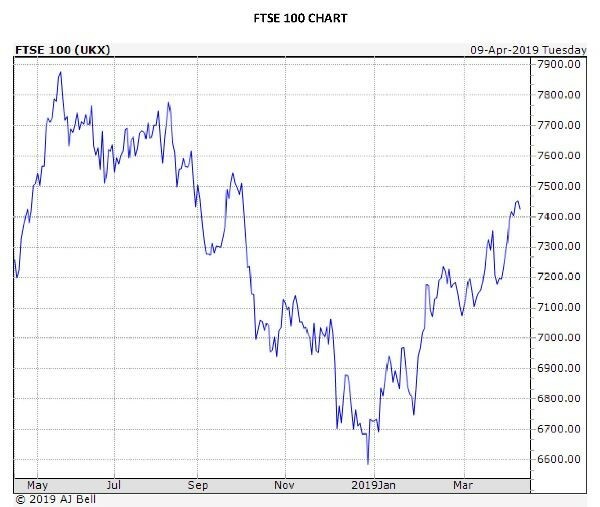 An example of the FTSE 100 peak to trough rebound is illustrated above. The political landscape remains fragile on many fronts, although according to speculation and commentary the Trade spat/dispute/war between China and the US is moving towards a resolution and firmer ground, which is partly why Global Investment Markets have rebounded strongly since the start of the year. The Global macro picture nevertheless remains uncertain so it is important not to get carried away and believe we have re-entered a new ‘bull market’ – ‘risk’ is a constant when investing. The EU and China are unlikely to move towards a Trade disagreement as both have their own ‘battles’ to fight at present but an imbalance is clear between these geographies. The US-EU trade spat looks like escalating over the row over tariffs on planes, which may be at the forefront of Trump’s views on Brexit. Monetary Policy is likely to remain accommodating for some time to come, given the political backdrop that ‘shifts’ investment sentiment. The ECB have few ‘tools’ with which to repair and run their economic engine, so no change is likely at present. We recommend to our advised investment clients that a risk based, risk adjusted portfolio is held, where we provide clarity of performance and transparency of risk management via a volatility metric – so investors invest in a risk model that passes the ‘Ronseal’ test – does what it says on the tin – remembering that risk assets fall in value, even holding the best quality asset allocation when markets fall. Often there is only one asset class that remains without capital loss when markets fall heavily – which is cash, so it is very important that all investors know and understand what seems obvious but is sometimes misunderstood. We demonstrate our ‘added value’ by out performance, advice and service; holding a mixture of quality long only funds (mutual funds) while blending these solutions with Structured Investment products (Capital at risk products) and Structured Deposit products (Capital secure), in order to meet the investment needs of the client, providing peace of mind and security over the long term, providing growth, income or both…. We know that what worries our clients/investors most is ‘not having a large amount of capital in retirement – and potentially running down their hard earned investments and savings’. We work hard to make sure the balance is correct – risk versus return. We have a clear message to investors, clients and the wider community…. At these uncertain, political and economic times the focus for investors must be on the need to build a structurally solid long term investment portfolio that is tax effective, built around the personal needs of the investor, that enables and ‘plans for’ the ‘bumps’ and ‘cliff edges’ that investors inevitably will face over the long cycle of investing, so investors can ‘ride out’ the surprises that sometimes are beyond the ‘pot holes’ that are normal along the investment journey. If you wish to discuss investment matters in a meaningful way, simply get in touch. We assure you of our best and focused attention at all times.